Social Media and education have a complicated relationship. Most educators come into contact with it for the first time through a negative experience – a disciplinary action involving students or even peers. As such, many administrators have actively cautioned teachers against the use of Social Media, and many educators themselves have condemned Social Media as a mere distraction to education. However, much like other tools out there, the reality lies somewhere in between. Let’s take Twitter as an example. If you’re unfamiliar with Twitter, it’s a microblogging platform. This means that users can share thoughts, links, and other information in short bursts of information (140 characters, plus links and/or media). 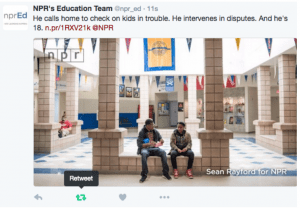 In the last few years, Twitter has emerged as a powerful platform for educators. In fact, teachers make up a significant amount of the traffic volume on Twitter, and roughly 25% of educators are users of the platform. This makes Twitter an excellent platform for educators to connect with others, share, and learn. Here’s a quick guide to get you started. This is the most obvious step – time to get an account! To start, go to twitter.comand sign up for an account. Create an account with your real name and set it to public; that’s right, limited privacy settings. Many of us have been taught to fear being ourselves online for everything from “stranger danger” to reprisal from employers. Your name is already available in the broad universe of the internet on a variety of media (try Googling it), so Twitter is really not a risky venture. Next, consider this yourprofessional account. This means you will be representing yourself as your best professional self, the way you would in a meeting at school or in the classroom. If you want to, set some personal boundaries to keep it professional (for example, no talking about politics or religion). Next, personalize your Twitter page – set a background photo and a profile photo. The default “egg” is a deterrent for many people to engage with you online. If you’re uncomfortable with it being a photo of yourself, consider an online caricature. 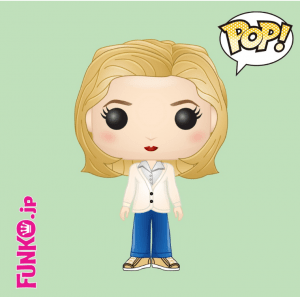 For example, you can post an avatar of yourself (both Funko Pop and Simpsons characters are popular) or select a photo of a beloved pet or a vacation photo. Finally, download the free iOS or Android App for your phone and/or tablet to access Twitter on the go. The interface is intentionally clean to make it easier to navigate. At the top, you will see the subjects: Home, Moments, Notifications, and Messages. Your “Home” screen will include Tweets posted chronologically (the newest at the top). In this feed, you will only see what the people who you follow publicly post. “Moments” highlights what is trending throughout all users as well as topics divided by subject. “Notifications” includes material directed at you – responses to your tweets, retweet notifications, follower notifications, and tweets directed directly to you. “Messages” are private messages between users – think of this like Instant Message. You will also see your number of tweets, people you follow, and your list of followers. On the left, there is a list of trending topics and hashtags (it will label those that are “promoted,” meaning someone has paid for them to be on this list). Who should I follow? Is a common question. Start with people you know and admire – an educational leader (like the secretary of education John King, Ph.D.), authors, academics, publications, thought leaders, and more. Next, you can go to lists like Mashable’s 10 Rockstar Teachers on Twitter to help you get started and expand your list. Don’t worry about following a lot of people. Be selective (at least initially). Lurk, read, and observe what these individuals are doing. I also like to go and see who my idols are following on Twitter and find a few new gems for my Twitter Professional Learning Network (PLN). The more you observe on Twitter, the more your following will grow organically. Nothing seems to cause more angst for newbies to Twitter than the concept of “hashtags.” Think of a hashtag as a way to categorize content on Twitter. 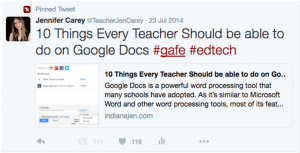 For example, if I’m going to share something about a new feature in Google Docs, I will add the hashtag #GAFE (GAFE = Google Apps for Education) to my tweet. This will allow anyone searching for news on #GAFE to find my tweet. Within Twitter, hashtags are hyperlinked – if you click on one with a tweet, it will pull up all tweets with that hashtag (divided into “Top Tweets” and “All Tweets”). This can be a great way to keep up with a particular topic trending on Twitter. If you would like a list of educational hashtags, check out this post that catalogues hashtags by subject and content. The biggest hurdle for new Twitter users to overcome is actually sharing content! However, it’s vital for engaging with your Professional Learning Network (PLN). You can share by “retweeting” a post. Do this by clicking the “retweet” button on a Twitter post to share and ensure that the original poster gets credit. Better yet, create and share your own content! Most newspapers and blogs now have a “share via…” button on their posts. This will allow you to share via a website itself which often automatically includes information such as a link and a title. You can then add your own text and hashtags (e.g. 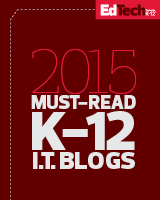 #edtech or #edchat) and then click share. To create a post from scratch, click on the “post” button on your Home screen. The button looks like a quill on a square, in the top right corner of your screen. You can then add text, links, photos, video, and more in the tweet window. Though you are limited to 140 characters (excluding links), share away! Once you get the hang of Twitter, you will see your PLN grow as you engage with others online, and you will probably find additional features on Twitter; check out more advanced lessons from Justin Reich in his article Teaching Teachers to Tweet. If you do, be sure to share your new tips and tricks with your PLN (on Twitter)! This entry was posted in Education, Educational Resources, Educational Technology, Professional Development, Social Media, Technology and tagged Ed Tech, EdTech, Education, Educational Resources, Educational Technology, PLN, Social Media, Twitter on July 5, 2016 by Jennifer Carey.